1. In medium saucepan, melt butter. Remove from heat. 2. Add flour and pepper, stirring until smooth. Gradually stir in milk. Bring to boiling, over medium heat, stirring. Reduce heat and simmer 1 minute. Add several drops Tabasco and dried beef. heat gently while poaching eggs. 3. Lift eggs to toasted muffins. 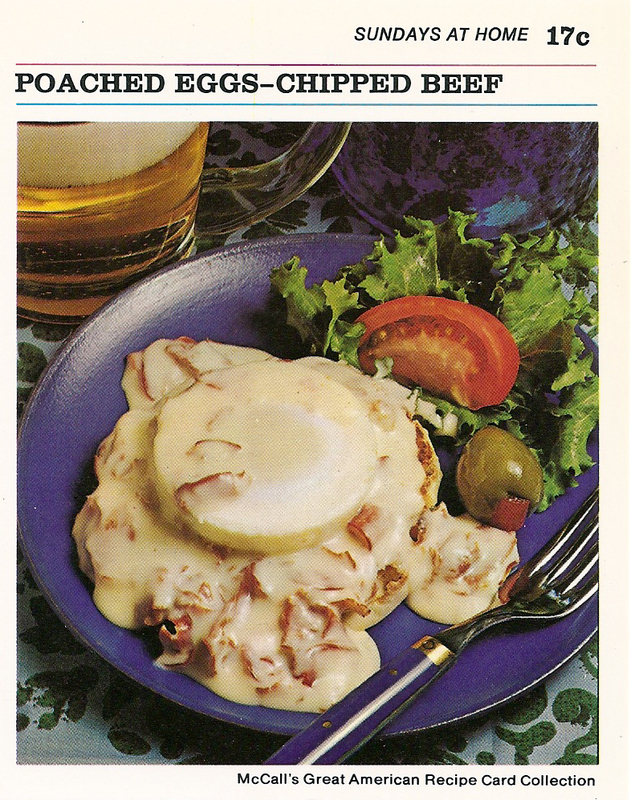 Spoon creamed chipped beef over top. Garnish with tomato wedges and olives, as pictured. How to Poach and Egg: Bring water (1 inch deep) in shallow pan to boiling. Reduce heat to simmer. Break egg into saucer, then quickly slip egg into water. Cook, covered, 3 to 5 minutes. Lift out of water with slotted pancake turner or spoon. Drain well.